Kaplan University is a higher education distance learning institution. The school is accredited by the Higher Learning Commission. Kaplan University is also part of the North Central Association of Colleges and Schools. Kaplan University is based in Davenport, Iowa. There are also 10 campuses to make education at Kaplan University more accessible for students. The University has over 3,500 faculty including educational instructors, professors and administrators. The school has been granting graduate-level degree programs since 2004. There are currently more than 66,000 online and on-campus students. Kaplan University has more than 3,600 instructors, administrators and professors. Kaplan University offers Associate’s, Bachelor’s, and Master’s degrees as well as certificates. Kaplan University offers education in business, healthcare, nursing, information technology, arts and sciences, and more. 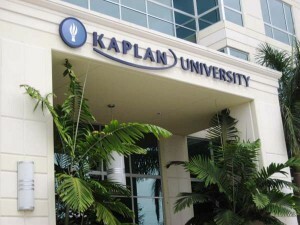 Kaplan University is organized into ten academic schools: Art and Sciences, Criminal Justice, Business, Health Sciences, Education, Information Systems and Technology, Legal Studies, Kaplan Continuing Education, Nursing and Concord Law School of Kaplan University. In 2007, Concord Law School joined with Kaplan University resulting in Concord Law School of Kaplan University. Kaplan University has an open admissions policy. This means that applicants are eligible for both grants and federal student loans. Kaplan University offers members of the military discounted tuition rates. Tuition is based on a variety of factors including graduate or undergraduate, in-state or out-of-state as well as if you are in the military. There are scholarships and grants available to those who qualify. There are also other financial aid resources available including student loans and financial aid. Online instructors and professors are required to hold two online office hours per week, and are also available via email anytime. On weekdays instructors must respond to a student’s email within 24 hours, and within 48 hours on weekends.This allows for the student to still have access to their instructors for educational reasons without having a physical campus. Weekly discussion boards are a part of each class curriculum, with a unit-related topic being discussed weekly by students and their classmates. Online scheduled sessions are held with audio chat capabilities. Core classes include required exams that must be completed within a given deadline. There are also weekly required assignments. Courses also have seminars which include the use of PowerPoint presentations and audio lectures.